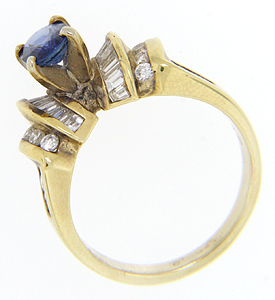 This 14K yellow gold estate ring has an interesting design. 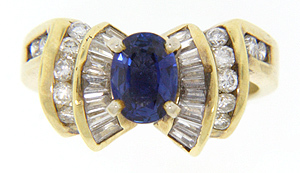 Not centered over the band, the sapphires and diamonds are offset from center projecting over one side of the band. 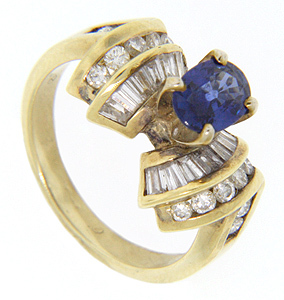 There is a .94 carat sapphire as the focus of the ring, but fourteen round and 16 baguette diamonds add elegance to the gentle curves of the mounting. There are approximately 1.02 carats total weight of diamonds. Circa: 1980. Size: 6 1/2. We can resize.